Plato was born around the year 428 BCE in Athens. His father died while Plato was young, and his mother remarried to Pyrilampes, in whose house Plato would grow up. 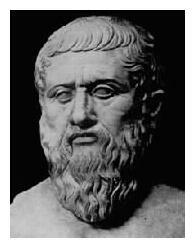 Plato's birth name was Aristocles, and he gained the nickname Platon, meaning broad, because of his broad build. His family had a history in politics, and Plato was destined to a life in keeping with this history. He studied at a gymnasium owned by Dionysios, and at the palaistra of Ariston of Argos. When he was young he studied music and poetry. According to Aristotle, Plato developed the foundations of his metaphysics and epistemology by studying the doctrines of Cratylus, and the work of Pythagoras and Parmenides. When Plato met Socrates, however, he had met his definitive teacher. As Socrates' disciple, Plato adopted his philosophy and style of debate, and directed his studies toward the question of virtue and the formation of a noble character. Plato was in military service from 409 BC to 404 BC. When the Peloponnesian War ended in 404 BC he joined the Athenian oligarchy of the Thirty Tyrants, one of whose leaders was his uncle Charmides. The violence of this group quickly prompted Plato to leave it. In 403 BC, when democracy was restored in Athens, he had hopes of pursuing his original goal of a political career. Socrates' execution in 399 BC had a profound effect on Plato, and was perhaps the final event that would convince him to leave Athenian politics forever. Plato left Attica along with other friends of Socrates and traveled for the next twelve years. To all accounts it appears that he left Athens with Euclides for Megara, then went to visit Theodorus in Cyrene, moved on to study with the Pythagoreans in Italy, and finally to Egypt. During this period he studied the philosophy of his contemporaries, geometry, geology, astronomy and religion. After 399 BC Plato began to write extensively. It is still up for debate whether he was writing before Socrates' death, and the order in which he wrote his major texts is also uncertain. However, most scholars agree to divide Plato's major work into three distinct groups. The first of these is known as the Socratic Dialogues because of how close he stays within the text to Socrates' teachings. They were probably written during the years of his travels between 399 and 387 BC. One of the texts in this group called the Apology seems to have been written shortly after Socrates' death. Other texts relegated to this group include the Crito, Laches, Lysis, Charmides, Euthyphro, and Hippias Minor and Major. Plato returned to Athens in 387 BC and, on land that had once belonged to Academos, he founded a school of learning which he called the Academy. Plato's school is often described at the first European university. Its curriculum offered subjects including astronomy, biology, mathematics, political theory, and philosophy. Plato hoped the Academy would provide a place where thinkers could work toward better government in the Grecian cities. He would preside over the Academy until his death. The period from 387 to 361 BC is often called Plato's "middle" or transitional period. It is thought that he may have written the Meno, Euthydemus, Menexenus, Cratylus, Repuglic, Phaedrus, Syposium and Phaedo during this time. The major difference between these texts and his earlier works is that he tends toward grander metaphysical themes and begins to establish his own voice in philosophy. Socrates still has a presence, however, sometimes as a fictional character. In the Meno for example Plato writes of the Socratic idea that no one knowingly does wrong, and adds the new doctrine of recollection questioning whether virtue can be taught. In the Phaedo we are introduced to the Platonic doctrine of the Forms, in which Plato makes claims as to the immortality of the human soul. The middle dialogues also reveal Plato's method of hypothesis. Plato's most influential work, The Republic, is also a part of his middle dialogues. It is a discussion of the virtues of justice, courage, wisdom, and moderation, of the individual and in society. It works with the central question of how to live a good life, asking what an ideal State would be like, and what defines a just individual. These lead to more questions regarding the education of citizens, how government should be formed, the nature of the soul, and the afterlife. The dialogue finishes by reviewing various forms of government and describing the ideal state, where only philosophers are fit to rule. The Republic covers almost every aspect of Plato's thought. In 367 BC Plato was invited to be the personal tutor to Dionysus II, the new ruler of Syracuse. Plato accepted the invitation, but found on his arrival that the situation was not conducive for philosophy. He continued to teach the young ruler until 365 BC when Syracuse entered into war. Plato returned to Athens, and it was around this time that Plato's famous pupil Aristotle began to study at the Academy. In 361 BC Plato returned to Syracuse in response to a letter from Dion, the uncle and guardian of Dionysus II, begging him to come back. However, finding the situation even more unpleasant than his first visit, he returned to Athens almost as fast as he had come. Back at the Academy, Plato probably spent the rest of his life writing and conversing. The way he ran the Academy and his ideas of what constitutes an educated individual have been a major influence to education theory. His work has also been influential in the areas of logic and legal philosophy. His beliefs on the importance of mathematics in education has had a lasting influence on the subject, and his insistence on accurate definitions and clear hypotheses formed the foundations for Euclid's system of mathematics. His final years at the Academy may be the years when he wrote the "Later" dialogues, including the Parmenides, Theatetus, Sophist,Statesmas,Timaeus,Critias,Philebus, and Laws. Socrates has been delegated a minor role in these texts. Plato uses these dialogues to take a closer look at his earlier metaphysical speculations. He discusses art, including dance, music, poetry, architecture and drama, and ethics in regards to immortality, the mind, and Realism. He also works with the philosophy of mathematics, politics and religion, covering such specifics as censorship, atheism, and pantheism. In the area of epistemology he discusses a priori knowledge and Rationalism. In his theory of Forms, Plato suggests that the world of ideas is constant and true, opposing it to the world we perceive through our senses, which is deceptive and changeable. In 347 Plato died, leaving the Academy to his sister's son Speusippus. The Academy remained a model for institutions of higher learning until it was closed, in 529 CE, by the Emperor Justinian.